Roy and myself were both freshman students at the "Art Center College of Design" and young and energetic. Art Center taught us to look for more creative angles and push the creative envelope past the standard stuff of the time. We experimented with new lenses, motor driven sequences, and intentional slow shutter speeds for a blurred almost painting like quality for some of our photographs. Roy and I were classmates and friends with other students like Larry Wood (Hot Wheels Designer), Ken Eberts (chair of Auto Fine artist Guild, Pebble Beach) John "Waldo" Glaspey (auto illustrator and Bob Davids, designer of Breedlove's land speed cars, as well as Nye Frank's "Pulsator." In the early sixties when Roy and myself were photographing at Lions, most photographers were shooting the standard angles they had been doing for years. We created some friendly competition for the Peterson boys which turned out to be good for the industry. "Drag News" ran an article calling Roy the new "Dean" of drag racing photography. The majority of photographers (including Peterson) were shooting mostly black and white with a little color for covers and centerfolds which was the norm for those early years. Roy and I shot a lot of color because we could process it for free at the lab at Art Center. Establishing a close trust with C.J. (Pappy) Hart, track manager, allowed us to seek out new track locations that enabled more interesting photographs to be made for Lions promotion. The gag shot of Prudhome and McEwen in the weeds done for "Drag News" (photo available) was a fun sample of outside the box photography. It was innovative for the time and still holds to this day. Another example of Robinson's creative genius and sense of humor. Toward the end of our tenure (1965) we began to see the beginning of big sponsor money and how it would change drag racing. I photographed the "Indy" Nationals in 67 and 68 and the World Finals in 1969. The only race after that was Seattle International in 1991 when I had Budweiser for a client and they wanted some shots of Kenny and the "Bud King". When TV first got involved with drag racing it was also the beginning of drag racing being legitimized and Wally Parks should be congratulated for making that happen. TV also provided the money to make the sport safer and better. It was a thrill to be involved during this period of drag racing. Roy, and myself have many fond memories and will never forget our many days and nights at Lions Drag Strip. Life long friend Roy recently gifted me his entire archive of drag racing photography. Roy is a very successful CEO and didn't have time to be involved with making prints etc. Roy's generosity allows me to share his photographic genius with drag race fans everywhere. Young photographers note: The majority of the black and white photographs were developed and printed in a two car garage with a dirt floor,cold water only and no heat. Roy and I would arrive at the garage around eleven pm after photographing the final at Lion's. We would process and print until about two am Sunday morning. Sunday we would give C.J. first choice for Lions promotion and then we were free to sell the others to Drag News and Drag World. 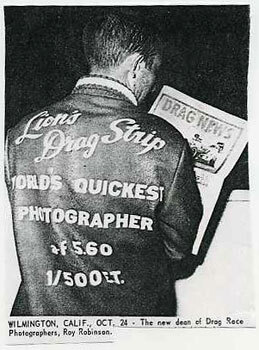 This routine was followed for every race at Lion's from 1961 to 1965. Roy's lab today is 37,000 sq .ft. filled with state of the art technology for printing giant photo murals for point of purchase displays for national retail chains. With very minimal beginnings and the education received at Art Center, we were able to have successful professional careers in the advertising industry. We hope you enjoy our photographic memories of a chunk of drag racing history. The best experience for myself is the continuing life long friendship with Roy and his family.